'To The Rescue' - Cats, written and photographed by animal behaviourist, Dr David Sands is a unique guide to providing rescue and re-homed cats and kittens with a new life. Due to the incredible increase in cat numbers in the UK, they have now become the number one companion pet. However, the darker side of this statistic means that at least a quarter of the population will be rescued and re-homed in their lifetime. Cats are independent and can be kept by people who are out working all day. They require little supervision and can become part of the cat rescue statistics by wandering, breeding or simply by being abandoned. There are approximately 8 million cats and kittens in the UK. 1.6- 2.4 million cats and kittens will have been rescued or re-homed. The cat rescue book is a 'world first' and is intended to help those with problem cats which have adversely affected by trauma or poor socialisation, re-homing and by being held in a rescue-centre environment. 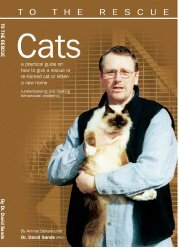 To The Rescue - 'Cats' includes a written and photographic record of David's successful treatment of feline behavioural problems. The book also includes details of his clinical work and information regarding local 'rescue' centres established and operated by dedicated individuals. To The Rescue 'Cats' is intended as a practical guide for anyone who has (or is thinking of) helping a rescue or re-homed cat. The guide is an important source of helpful and expert information. The book is available for £10 (p&p included - payable to Dr David Sands) saving £2.00 on RRP and p & p.
Special 2008 Offer - Only £6.00 (inc. p&p).